There’s a world of difference between operating short haul and long haul routes. Before new technology, longer range narrowbody aircraft such as the Boeing 737MAX and Airbus A321LR, airlines generally had to operate widebodies on routes over about 3,000 miles and bear their much greater costs. It’s therefore no surprise that airlines look for the most cost-effective widebody aircraft for their long haul operations. Does it also make sense to operate a relatively simple fleet, minimising the number of long haul types to avoid complexity costs? A quick glance at the widebody aircraft of larger network carriers shows that most of them have complex fleets. Sometimes this is because of merger inheritances – for example, American’s overlapping Boeing 767-300s, 777-200s (in more than one cabin layout), Airbus A330-200s and A330-300s came from merging US Airways’ fleet into the American stable. American also now has Boeing 787-8s and 787-9s in this class, so now has no fewer than six aircraft types in the 200-300 seat category. Much smaller airlines also have complex widebody fleets. Swiss has 29 widebody aircraft of three different types accommodating between 219 and 340 passengers. The mix of types enables Swiss to operate some long sectors with a smaller, higher unit cost aircraft with long range (the A340-300) while using a large widebody (777-300ER) with lower unit costs on high demand routes. A long haul route with a daily frequency can cost over $100 million a year to operate, so saving tens of millions on trip costs with the A340 makes sense if the demand simply isn’t there to fill a 777-300ER. Swiss also has the more economical A330-300 for shorter long haul routes. In Asia, Korea’s Asiana currently has 43 widebody aircraft split across five types including a mix of Airbus and Boeing aircraft – a truly diverse and complex widebody fleet. So, current practice shows airlines operating multiple widebody types in their fleets. I’ve been looking at US operating cost data to see if this fleet complexity makes sense. The data (from DOT Form 41 for the first half of 2017) cover the four major US carriers operating widebody aircraft, American, Delta, Hawaiian and United. 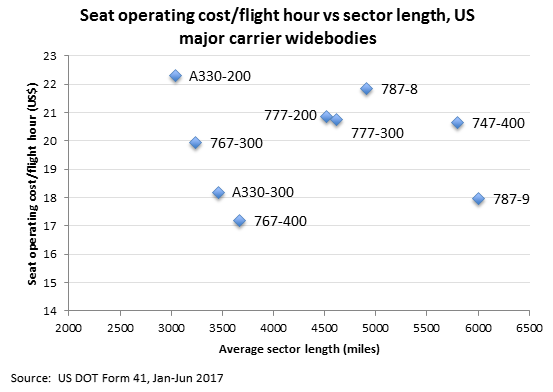 I’ve analysed unit operating cost (seat operating cost per flight hour – see note at the end of the posting) between types. Although there’s some inconsistency in reporting between the carriers, the analysis gives interesting pointers about the complexity of long haul fleets. According to the data, the widebody aircraft in US carrier service with the lowest unit operating cost is the Boeing 767-400 with an average age of 17 years – the second oldest widebody type in the data. The aircraft type with the second highest unit operating cost is the second youngest, the Boeing 787-8. There is no direct correlation between aircraft age and unit operating cost. This finding may not be a surprise as ownership costs on older aircraft like the 767-400 should be relatively low, but the data suggest that maintenance costs are low too. What about size and cost? The data suggest that larger widebody aircraft don’t necessarily bring lower unit operating costs. The two largest aircraft operated by US carriers, Boeing’s 777-300ER and 747-400, had above average unit operating costs – even after normalising the data for differences in cabin configuration. Those differences in layout also tell a story. American’s 777-300ERs have 15% fewer seats on board than United’s 777-300ERs and only 6% more seats than Delta’s 777-200s, thanks to having a higher ratio of First and Business class seats. Within American’s widebody fleet, the proportion of premium cabin seats to total seats varies from 8% on the A330-200 to 12% on the 787-8 and 19% on the 777-300ER. Having multiple cabin configurations gives flexibility to deploy the right amount of premium seats onto the right routes to cater for differing levels of premium demand. The data show that the unit operating cost in the first half of 2017 for the A330-300 and the Boeing 787-9 was similar but the average sector was nearly twice as long for the 787-9. So, for an airline operating relatively shorter longhaul routes, the A330-300 can be cost-effective compared with a 787-9. The new Boeings have huge range flexibility, greater cargo capability and their greater fuel efficiency will win if oil prices rise. But at the right cost levels for ownership and fuel, the A330-300 can compete against its newer rival. For the future, the new narrowbodies promise unit operating costs within the range of widebody costs. That will give airlines an opportunity to reduce complexity by operating short haul and some long haul routes with the same narrowbody aircraft. But chances are that there will still be complexity in many airlines’ widebody fleets.